There are certain images that recall an era of deep southern tradition. Things that look like they belong to Southern Culture out of shear necessity. Seersucker is an iconic fashion statement, born and bred for the heat and humidity of the South. A statement is made every time you wear this unmistakable fabric; a reflection of the laid back spirit of the South. Seersucker is a classic. The Seersucker Suit is a requirement for every Southern Gentleman. A garment of pride, worn from the start of Spring till Labor Day. The distinct vertical blue and white strips, and the soft, airy, all cotton fabric brings a certain level of comfort when the heat of the South is almost unbearable. 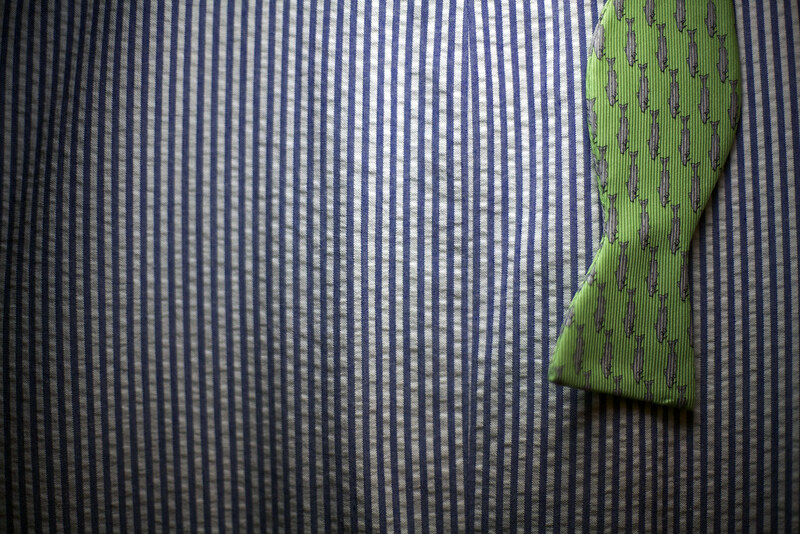 Seersucker is ready for all occasions. Whether an Eastern Sunday service, a warm summer wedding, or a night out on the town, it can be as formal or casual as the event your attending. Seersucker begs to be paired with a great bow tie, and a comfortable pair of loafers. Seersucker should even worn by the finest Southern Belles, always paired with their favorite string of heirloom pearls. Seersucker is a piece of Southern Culture, that everyone should enjoy for a lifetime. Wear it often. One very important question… must seersucker only be blue and white? Could other colors work for seersucker? Especially red/pink and white or green and white? OR should we not mess with a classic. As long as its all cotton and worn with pride. Nothing beats the original though. Where have I seen that bow tie before? It looks painstakingly familiar…almost as though I’ve worn it before. Oh, and seersucker pairs well with attire from Sunday slacks to Army fatigues witha popped collar (I’ve done both in honor – or making fun of – my boy).